Joe Robb returned to Newton in 1985 after graduating from Kansas University with a Business Administration degree and obtaining his law degree from Washburn University. Joe's interest in business and his comfortable style with people combine well in his practice of business, estate planning and family law. 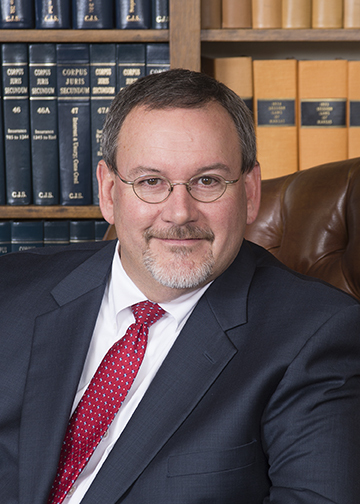 Extensive experience in divorce, child custody and support issues as well as work with contracts, corporations, small business, real estate transactions and collections is the focus of his practice. In addition Joe has experience with Wills, Trusts, Powers of Attorney and similar estate planning tools. Joining his dad and brother in the firm anchored by his grandfather for over 40 years in the town he grew up in has been real enjoyable for Joe. And, like those before him, Joe's been active in his community. A proven leader, Joe has served as President or Chairman of the Newton Area Chamber of Commerce, the Greater Newton Foundation, the Kansas Behavioral Sciences Regulatory Board, Harvey County Big Brothers and Sisters, Leadership Newton, the Harvey County Republican Central Committee, St. Matthew's Episcopal Church and the Newton Rotary Club. Joe has also been active with Kidron Bethel Retirement Services, Inc., Central Kansas Community Foundation, the formation of a public wholesale water supply district and several endowment corporations at his church. Professionally Joe has served on a Kansas Judicial Council advisory committee, as a long term Trustee of the Harvey County Law Library and as President of the Harvey County Bar Association. He is further affiliated with the Wichita and Kansas Bar Associations, Sigma Alpha Epsilon Fraternity, Alpha Kappa Psi Business Honorary and Phi Delta Phi Legal Fraternity. Joe's honors include having graduated from Leadership Kansas and receiving the Newton Distinguished Service Award. He has also served as Harvey County Chairman for Governor Mike Hayden and Senator Bob Dole. Joe's wife Joy is Vice President of Human Resources at Prairie View, Inc., a comprehensive mental health institution and she and Joe have two daughters, Betsy and Caroline. Joe spends weekends insanely cutting firewood in the Flint Hills and enjoying Marion Lake. Swimming, hunting, fishing, boating, walking and time with friends and neighbors round out Joe's interests.